Following days of sideways movement, the arrival of the bulls on 6 March pushed the collective market cap to $134 billion. 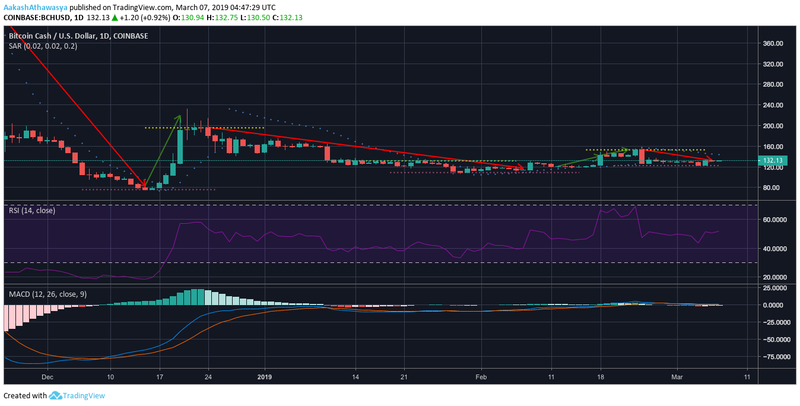 Bitcoin Cash [BCH] saw some upward movement, but failed to gain momentum. Bitcoin Cash saw an uptick against the US dollar by 2 percent and was at press time, trading at $134.81. The coin’s market cap stood at $2.38 billion, only $180 million ahead of a skyrocketing Binance Coin [BNB]. In terms of exchange dominance, P2PB2B took the top two spots via the BCH/BTC and BCH/USD trading pairs, accounting for $29.44 million and $18.31 million of the global BCH volume. Bitcoin Cash has been trading around the $130 mark for a while, barring the drop between March 4 and March 5. The aforementioned downtrend pulled the price down from $129.57 to $122.98, following which the coin’s price boomed from $123.06 to $131.74. The coin’s immediate support level stood at $129.76, while the immediate resistance level of the coin was $131.69. The Bollinger Bands showed a decline in the coin’s volatility as the coin’s price movement was relatively stable, while the Moving Average line showed a bullish market. The Chaikin Money Flow tool showed that the inflow of money into BCH tokens was positive at press time. However, the CMF line looked to dip below 0 soon. The Awesome Oscillator indicated that short-term momentum was rising and bullish activity was expected as the concluding bars were green. The one-day BCH trend line showed two significant downtrends and one lone uptrend. The first downtrend stretched from late-December to February, pushing down the price from $196.63 to $117.75, and the next from $153.67 to $132.52. The uptrend pulled up the price from $121.44 to $153.67. Bitcoin Cash found immediate support at $122.45, while the coin’s immediate resistance level stood at $153. The Parabolic SAR pointed to a bearish trend, despite the coin’s green wave as the dotted lines were above the coin’s trend line. The Relative Strength Index pointed to a decrease in investor interest as the RSI had fallen from 68.73 to 51.71. The MACD indicated a bearish swing to the market as the Signal line had overtaken the MACD line. Short term indicators pointed to a bullish market, with volatility relatively low and short-term momentum looking to rise. In the long-run, the coin’s market looked bearish because of the longevity and severity of the downtrends since November 2018. Furthermore, investor interest was on a decline, further extending the long-term bears’ reign.